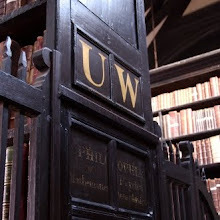 Chetham's Library: Who can stand before His cold? 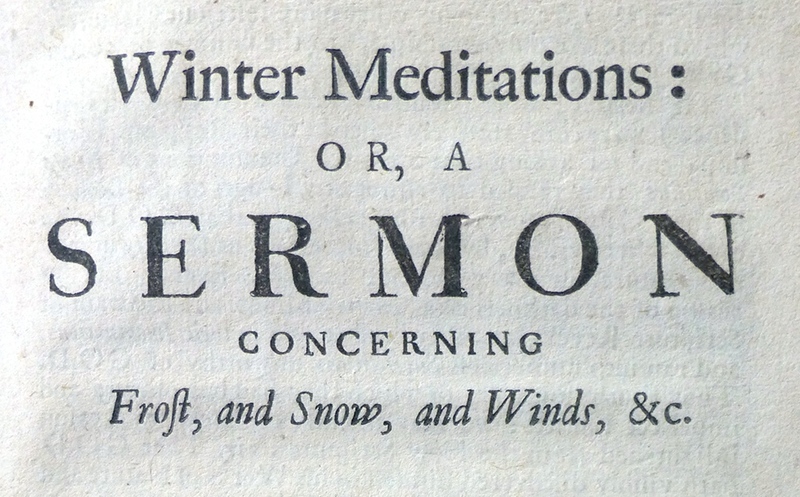 Who, indeed. This seasonal sermon on snow from the seventeenth century was written by the aptly named John Shower, a Presbyterian minister working in London, who was inspired to respond to the severe winter of 1694-5 with a lyrical exposition of Psalm 147 and the greater mysteries of God. 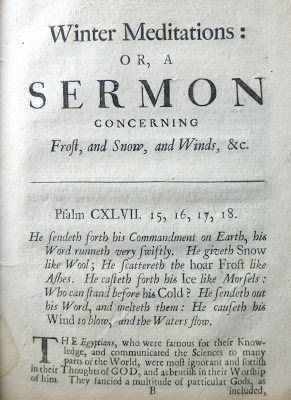 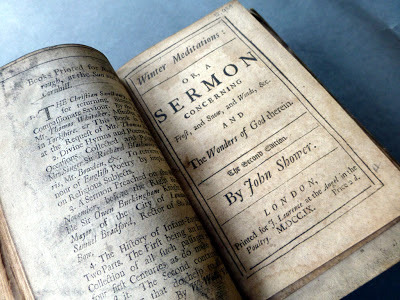 The Library holds both first (1695) and second (1709) editions of Winter Meditations, or a Sermon concerning Frost, and Snow, and Winds…, in which the Reverend Shower, who was evidently popular with his contemporaries and is described as having 'a very zealous, lively manner', holds forth on the nature of winter weather. At turns poetic: 'Snow like wool, that descends silently, and lies on the ground like a fleece of wool; so that no sheep is more warmly clad with wool than the earth by great snows', he also exhorts the reader to find spiritual riches in the ravages of the icy weather: 'The extreme cold of the season may assist to warm our devotion and reverence towards Him'. 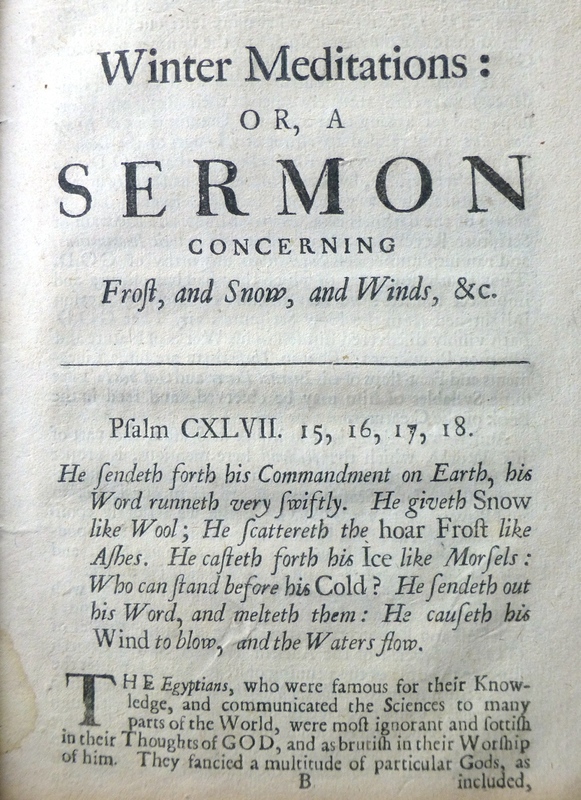 Nor does Shower shy away from the natural extension of his metaphors. 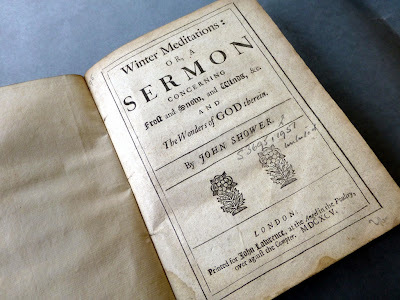 The first edition includes a dedication to the Lord Mayor of London with a lament for the death of the Queen, 'which compell'd the intelligent world to differ from the natural, and in the midst of that severe frost, made so universal a thaw, as if England were dissolving in its own tears'. With thanks to our friend Patti Collins, formerly of Central Library, who is generously volunteering her time to help at the Library, and wrote and researched much of this post. 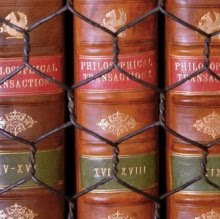 Our latest newsletter is now live!